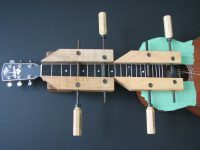 Not ready for a Sitar? Recently did a project for Nelson based accomplished musician Andrew Ross. 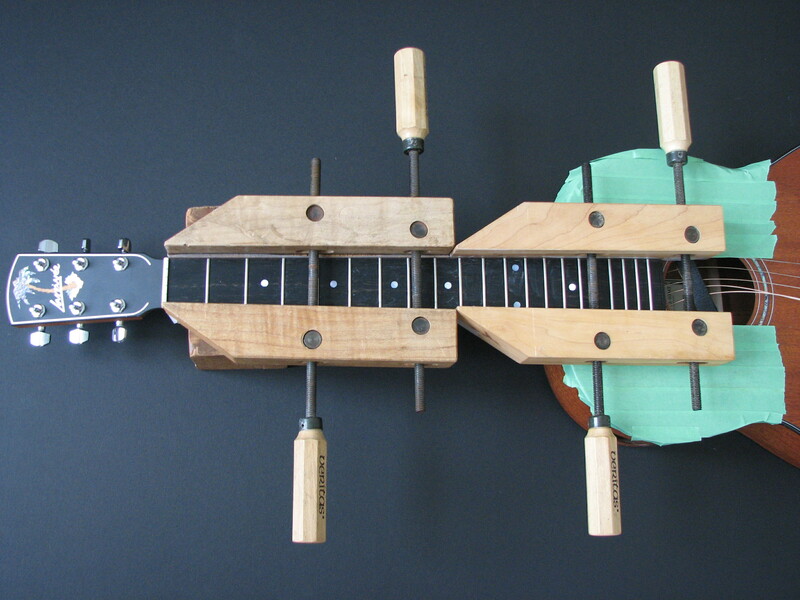 Andrew asked for a left handed dulcimer on a guitar body with some sitar overtones. 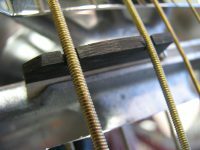 Only the two plain steel octave strings have the Jawari effect. 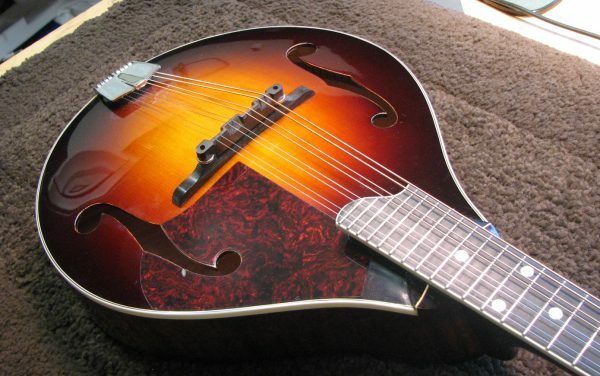 We found this reasonably priced and intriguing Del Oro at one of my favourite used guitar sites called Antebellum Instruments for the project. 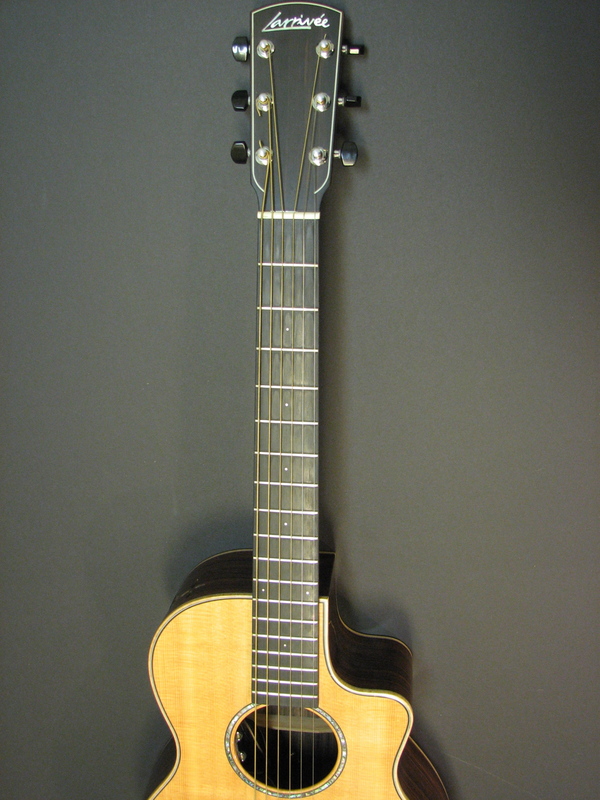 Andrew kindly posted a YT video of some inspired playing that arose shortly after he received the modified 1940’s Kay. 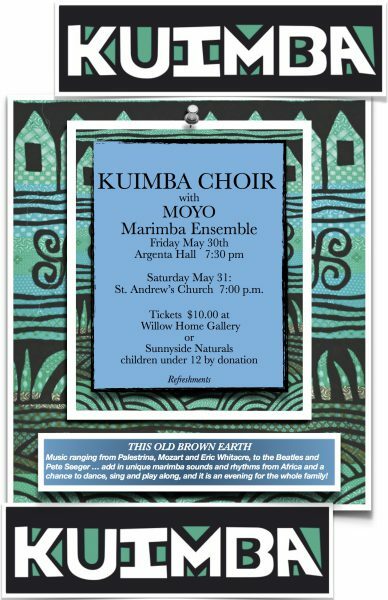 Moyo Marimba plays at Kuimba Choir concerts! If you’ve never seen a marimba band playing instruments they’ve made and you like to dance, now’s your chance! Karen Behns fantastic community choir will be performing in Argenta tonight at 7:30 at the Argenta Hall and Tomorrow night, Sat the 31’st of May at the United Church in Kaslo, also at 7:30pm. Moyo Marimba will perform somewhere in the middle of their performance to give the choir a break, see you there! This client doesn’t like the traditional raised pick guards and associated hardware found on many mandolins. 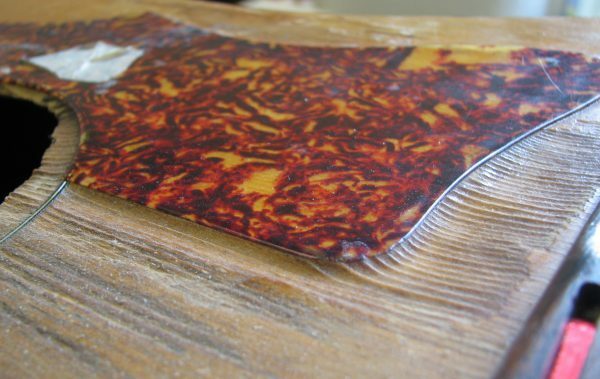 So we installed a faux tortoise shell directly onto the surface of his Eastman MD 505 A-style Mandolin in classic sunburst. 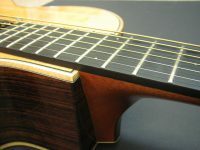 Happy to say there was no significant affect on the tone of the instrument and he was pleased with the function and the aesthetic of the pickguard! 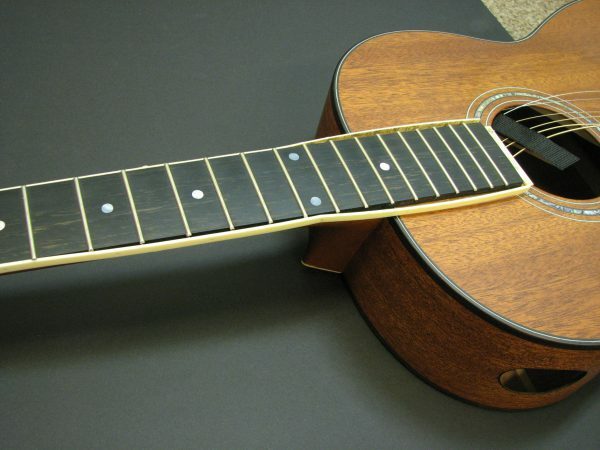 The top was refinished on this 70’s Gibson below (at the request of the owner!) 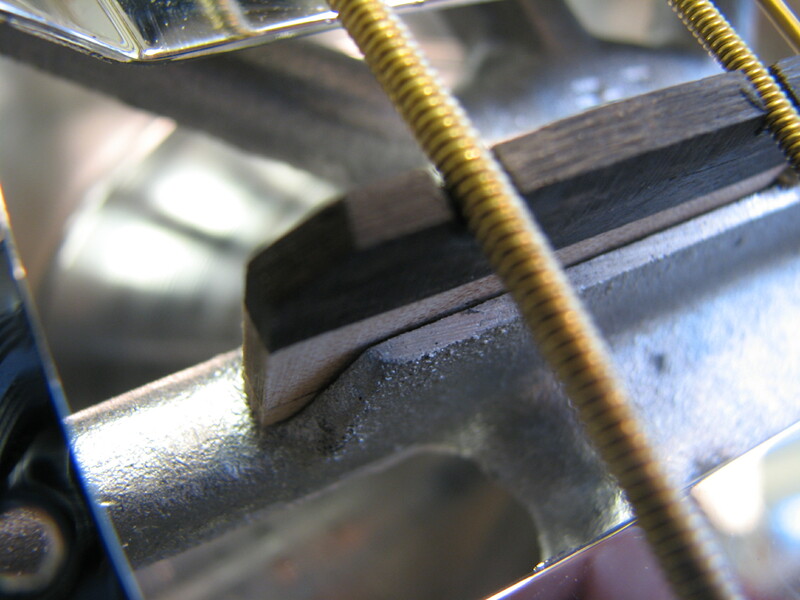 and we used a clear pick guard to replace the original which had left a patch underneath that wasn’t so UV affected. Overall a neat effect as it looks as though the pick guard is made of the same wood as the top just a slightly different hue. 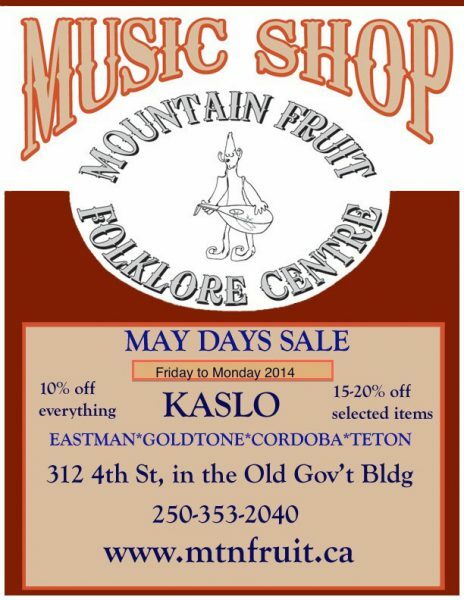 While you are taking in another fantastic Kaslo May Days come and visit Mtn Fruit for discounts on quality stringed instruments! This is our 3rd annual May Days sale and we enjoy a visit and chat from new and returning customers. 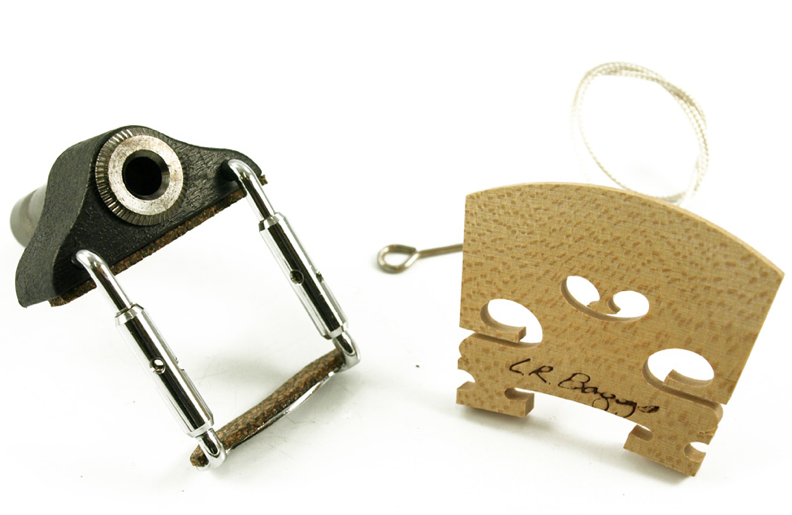 We stock and install the popular LR Baggs Violin Bridge Pickup. Getting the most (tone production) out of any violin bridge requires proper fitting and carving of the bridge to your specific instrument. 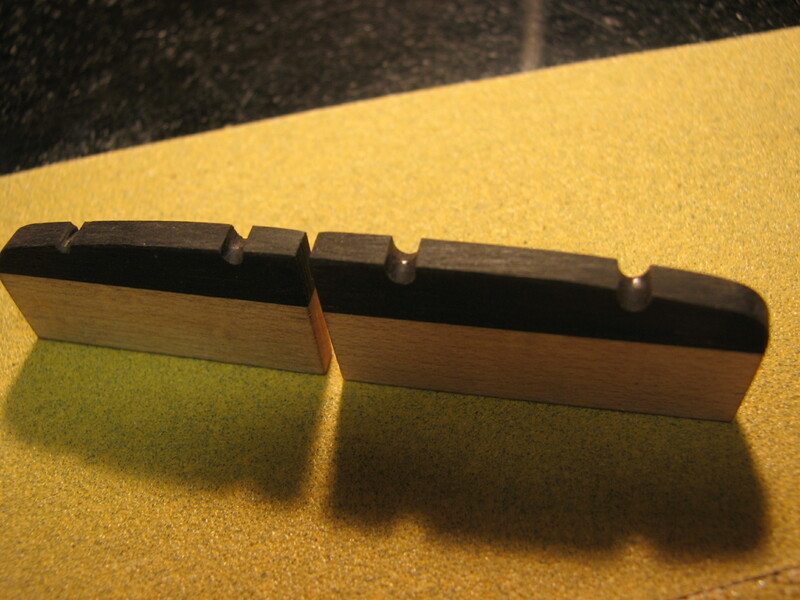 The bridges come as an oversize blank as seen in the photo below. Getting a perfect mate between the feet and violin top as well as correct thicknessing and bridge location are critical to good tone production. This is especially true for the LR Baggs Superieur Despiau bridge with pick up as an integral part of the bridge. 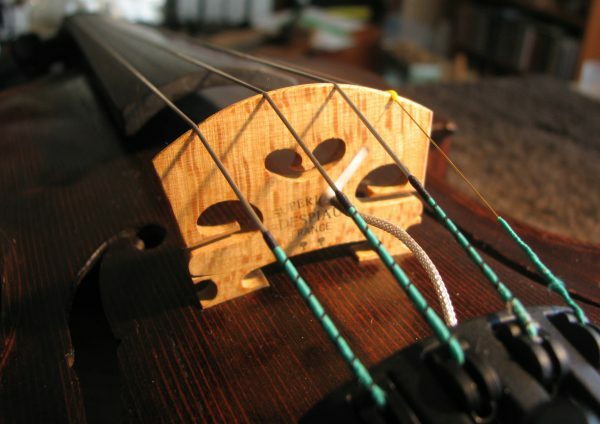 They are expected to perform acoustically and amplified, a bit of a compromise but fitted correctly they are certainly the choice of many violinists and produce enjoyable results in both realms. Back to work and busy! 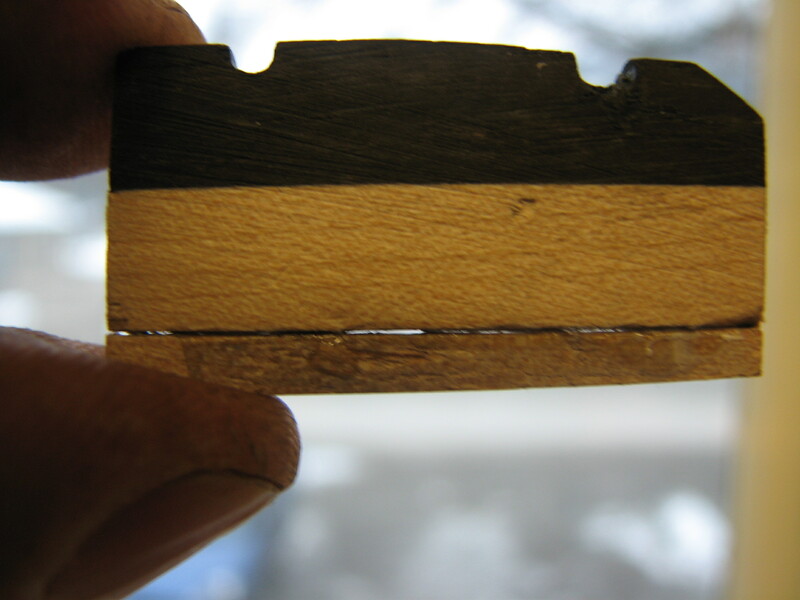 Well, for reasons unknown to myself, January is always busy in the repair shop. Thus my lack of attention to the digital realm. Many interesting projects and repairs in the shop right now and with a few more tweaks to the website I hope to share more of what happens in the back room at Mtn Fruit. 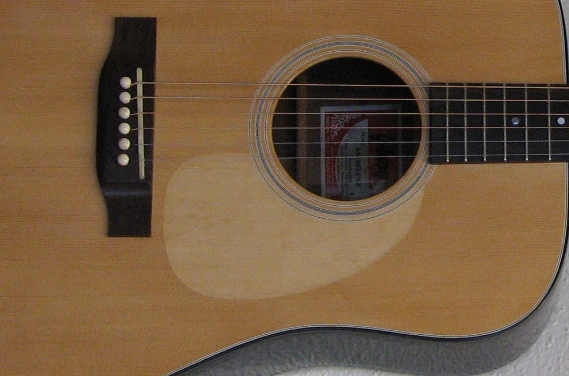 Thought I would share a photo of this well loved Gibson J-40, almost looks sandblasted around the pick guard, still sounds great and is played regularily! Will be closed till Jan 3rd. Taking a much needed rest but must apologize for stating in the Valley Voice that I would be open on Christmas Eve till 3pm, I won’t! See you in the New Year, thx for your support! Adam casually wandered into the shop a few weeks ago and we hit it off immediately through our mutual love of all things Canadian. Especially the landscape and folk music. Since winning the FCMF National Guitar Competition in 2010 at Montreal,QC Adam has turned his attention to solo paddle trips in Algonquin Park, Ontario. This park inspired many a painting from the ‘Group of Seven’ and Adam has followed in their footsteps composing original sketches on guitar and choreographing these compositions with film footage from his sojourns. The result is an ethereal beauty that immediately finds a place in the mystery of your adventurous, Canadian heart! Thanks for sharing your creative energy Adam and we look forward to your upcoming winter album for which I know you are receiving great inspiration and suitable low temperatures in Yellowknife, NWT at present! Check out Adams CD below and also the Adam Ruzzo’s Facebook for more info. The guitar Adam is playing is a Cordoba C7 with Euro Spruce top and Indian Rosewood back and sides which can be played and purchased at Mtn Fruit. You can also listen to this interview and more on Radio Free Kaslo with Randy Morse. And Kaslo’s own Kuimba Choir director, Karen Behn! 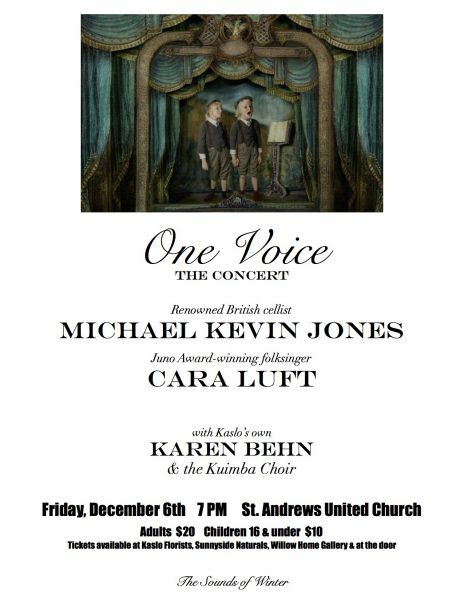 Join us, please, at 7pm tonight (Dec 6th), at the United Church in Kaslo for a skilled, musical and creative journey. 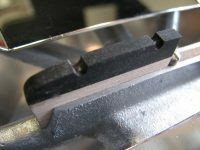 Stanely wandered into my shop back in early October I think, took me awhile to get to this post! He left me with some CD’s which he says were 10 years in the making. 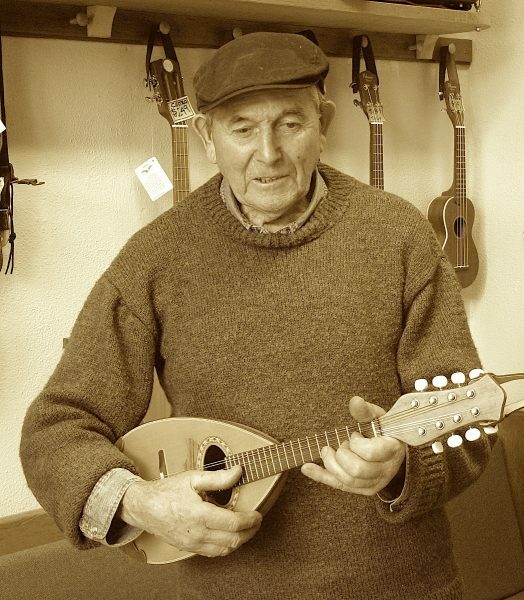 All original mandolin tunes (on a Neopolitan mandolin his father acquired in Kaslo I believe) about his time working and exploring as a young man at the North end of Kootenay Lake. He lives in Montreal now(most of his kids, raised in Montreal, have moved to the Kootenays) but grew up around Nelson and worked in the Lardeau and Duncan Lake area as a young man. His father, William Triggs was the purser on the sternwheeler SS Moyie for a time in the early 1900’s. He returns every year to spend time at his cabin in Meadow creek and this year was working on reclaiming an old indian trail on the North side of Hammill Creek. Thank you for sharing your music and stories Stanley! Neil Johnson and Louis Bockner are the spark behind MRP. Although I would say, and I think Neil and Louis would agree, it’s ‘all of us’ who are creating the MRP. Universal consciousness in action, illuminated daily in the ordinary magic of people expressing themselves through music and other existential musings looking for a voice. Here is an MRP clip featuring myself, Jeremy Behn, touching on the reincarnation aspect of helping souls inhabit or extend themselves into the vessels we know as musical instruments, one aspect of what I do at the Mountain Fruit Folklore Centre. The work these two are doing is full of passion and inspiration. Their dedication to quality with regards to video/audio and attention to artistic detail is remarkable. It’s film like these two are creating that inspires us to make change in our lives and let that change ripple and overlap into the change of others. And go to their Indiegogo page if you’d like to support their project, it’s worth it! I’ve never heard this trio but it sounds as though they easily invoke medieval romance or a trip to the outermost moon of Uranus. 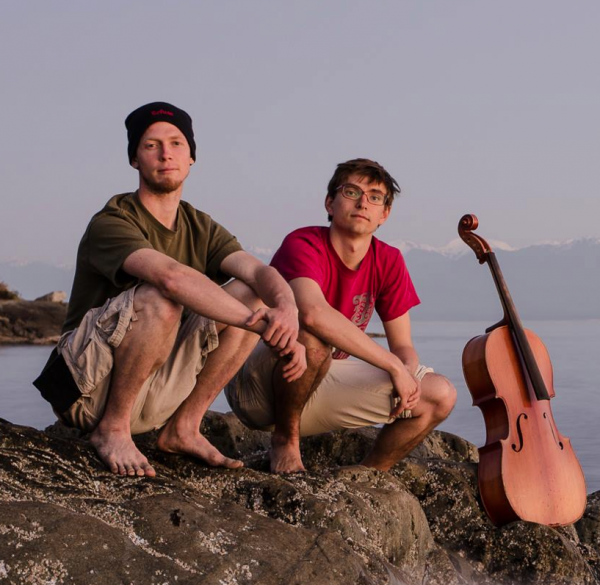 I’m predicting another world class concert put on by the Kaslo Concert Society. 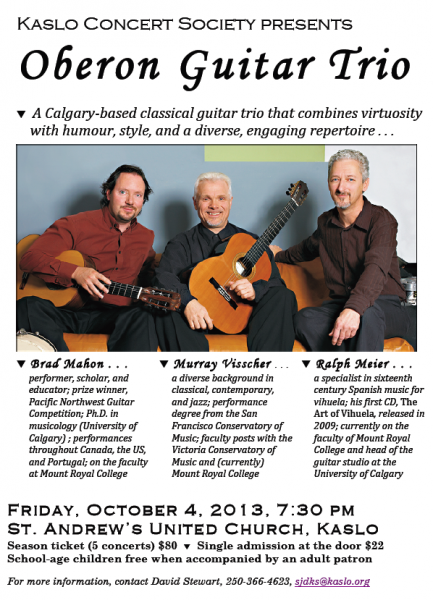 Friday, October 4, 2013, 7:30 pm St. Andrew’s United Church, Kaslo, BC. 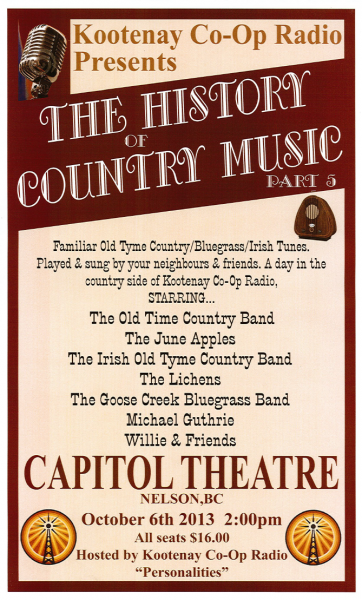 The poster shows the way but let me say; Jim is a true resource on the history of these ‘Old Tyme Music’ genre’s. 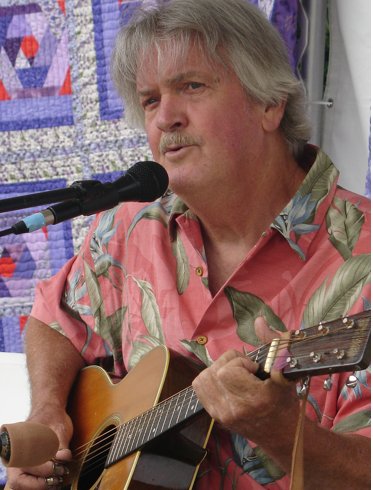 He is featured weekly on Kootenay Co-op Radio with his show, ‘Liner Notes‘ and always has some rare and intersting songs and info from long ago. It’s a history lesson with someone who is passionate about the music he likes! I might add that he has a wonderful radio voice and endearing stage personna in just being himself, this Capitol Theatre show will be a cozy, funfilled afternoon. 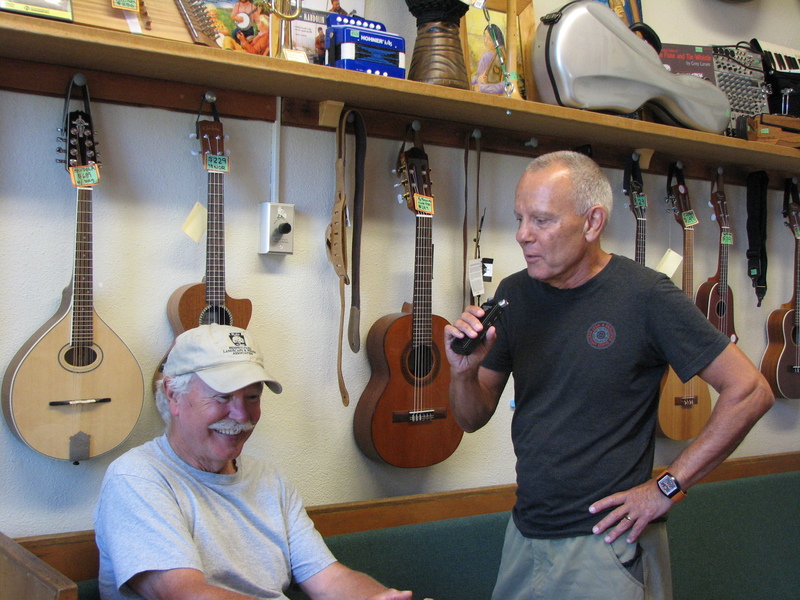 That’s Jim on the left being interviewed by Randy Morse of Radio Free Kaslo about his upcoming show. This interview should be broadcast on Friday, October 4th, 11am on Kootenay Coop Radio. I took in Saskia Overbeek and Darrel Delaronde’s show for a second time in around a year I’d say. Previously at the Langham and this time at the United Church yesterday evening. As husband and wife they have a wonderful rappore on stage and don’t hesitate to throw in a little gender humour. They’re both great storytellers in song and in between songs. Comfortable Canadiana at it’s best! Next year we’ll be sure to corner them for a Radio Free Kaslo interview. 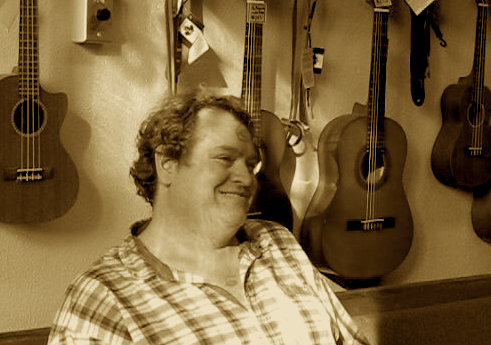 Michael Guthrie will be performing his eclectic mix of music at the Langham on Sat, Sept 21 at 7:30pm. If you don’t know Michael, visit his website, to find out more about his spearheading the rescue of the very theatre he will be performing in, which took place more than 30 yrs ago! 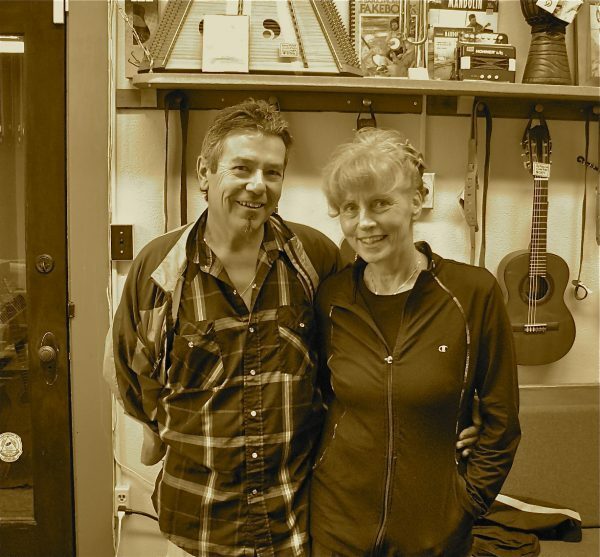 You can also find out more about Michaels musical journey on Radio Free Kaslo’s May 24th show. Only musician I’ve ever seen play ‘Shortnin’ Bread’ on a 2 stringed rebec derived from the arabic rebab, I’ve been learning lots about stringed instrument history from Michael on his visits to Mtn Fruit, thanks Michael! 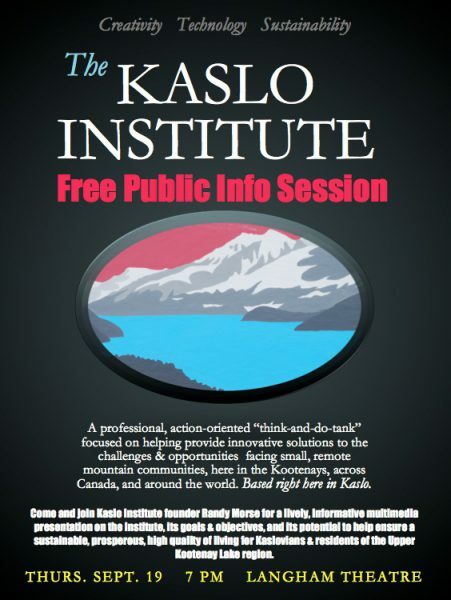 Kaslo resident Randy Morse (host of Radio Free Kaslo) has a beautiful, cooperative, sustainable and exciting vision for the Community of Kaslo and surrounding area. Come and learn more about this vision Thurs, Sept 19th, 7pm @ the Langham Theatre. Here is a few minutes of footage featuring Randy Morse interviewing Morien Jones just before his Childrens CD Release Party. The event was well attended despite a few drops of rain and I highly recommend anyone with or without kids make an effort to catch Morien live. Moriens music is very strong rythmically and both kids and adults can’t stay still when he plays. 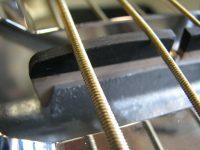 Love your music Mojo! 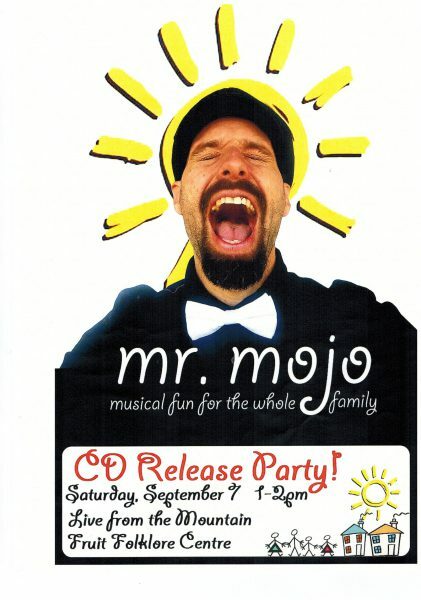 CD Release Party for Morien Jones! 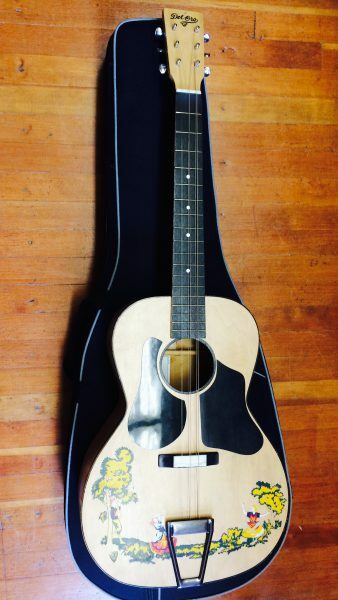 Morien Jones is a dear friend and wonderful musician who has a gift for connecting with, and enjoying children just as they are! As gifted as he is he has worked tirelessly on all of his musical skills, whether it be performing, recording or songwriting. 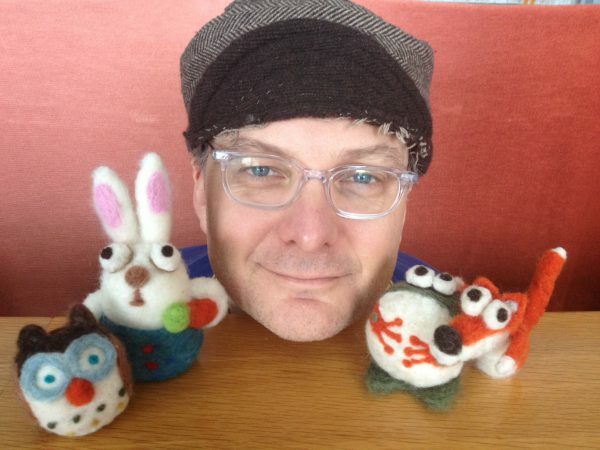 This is his first full length CD of music for children. Come on out and have a short rest on Sat, Sept 7th from 1-2 PM on the lawn of the Kemball Ctr, while the kids follow the piper! 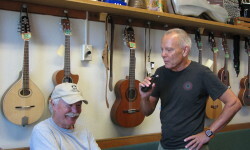 Blues singer Kirby Sewell (pronounced soul) from Calgary visited Mtn Fruit yesterday for an Radio Free Kaslo interview. 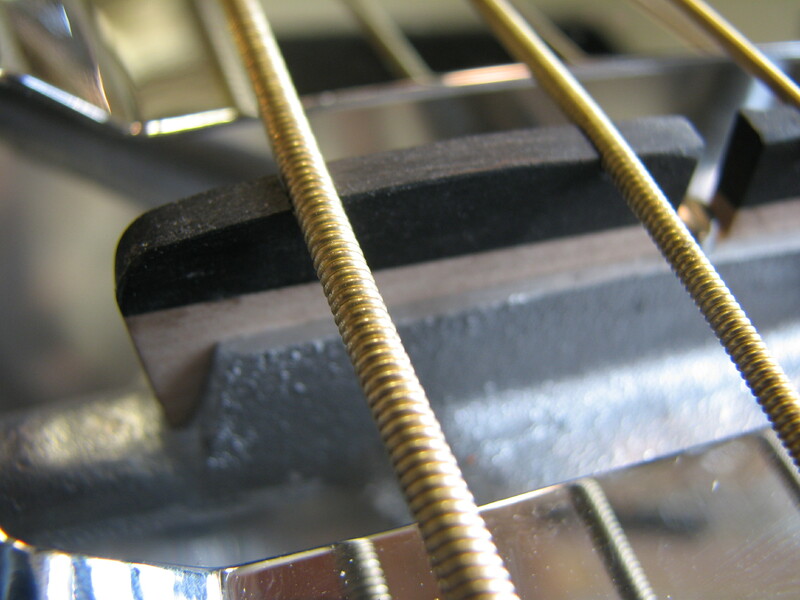 Kirby played Kaslo Jazzfest in 2012 and was well recieved. Without giving too much of the interview away Kirby loves to laugh and talk about the business side of music. Look for Kirby’s interview at Nirvanna Chronicles in the coming weeks. On Saturday Aug 24th I attended the Nimble Fingers Concert with a market booth. Met lot’s of fine folks and heard some great music. I also had the pleasure of meeting Mike and Annie of Clawhammer Press in Fernie, BC. 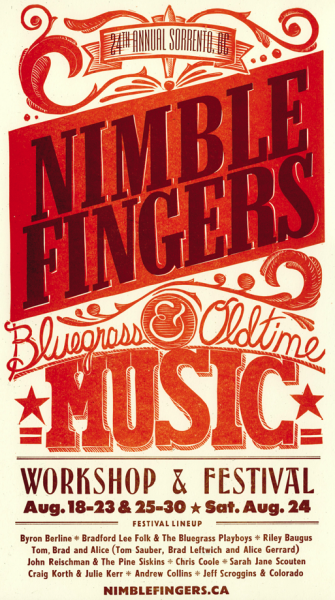 Mike is the creator of the beautiful poster for Nimble Fingers which is printed on ‘turn of the century’ letter press equipment! Love what you are doing Mike!